Jordan Horowitz knew something was wrong the moment he saw people in headsets scurrying across the Oscars stage. What Mr. Horowitz said — “There’s a mistake. ‘Moonlight,’ you guys won best picture” — was one of the most surprising reversals in Oscar history, with apparent human error combining with live television to powerful, jaw-dropping effect. It was also a painful reminder, on the most celebratory night of the year for the film industry, that no system of voting is perfect, and it warped and dampened the euphoria of film executives and artists who had spent years working on the two movies. And for the academy, which had been criticized last year for #OscarsSoWhite, there might have been something of a missed moment: Instead of a proper celebration of “Moonlight,” with its all-black cast and touching personal narrative, there was a televised scene of confusion, disbelief and astonishment. Many details remained unclear on Monday morning, including how the envelopes were handled backstage before Mr. Beatty and Ms. Dunaway came out and why the error was not corrected more swiftly. 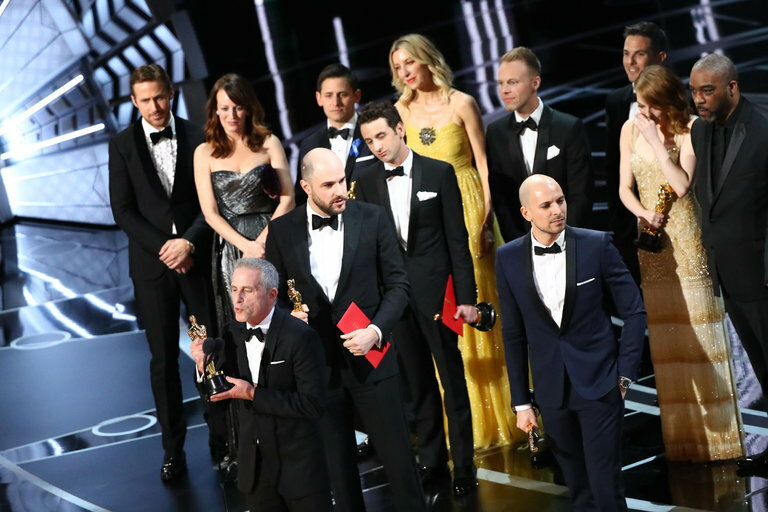 Three “La La Land” producers had given acceptance speeches before the mistake was announced. For the filmmakers and actors in “Moonlight,” those final seven minutes of the Oscars ceremony — from Ms. Dunaway’s announcement of “La La Land” to the discovery that “Moonlight” had won to the speeches by its producers, Mr. Beatty and Mr. Kimmel — were no less stunning. Less than two minutes later, Mr. Holland was on stage with his “Moonlight” family. Afterward, Mahershala Ali, who won best supporting actor for “Moonlight,” said backstage that he had been thrown by the turn of events. “I just didn’t want to go up there and take anything from somebody, you know?” he said. Mr. Jenkins told Entertainment Tonight that he “could see it in Jordan’s face, that he was speaking the truth,” referring to Mr. Horowitz. How can the presenter be given a wrong envelope?? ?